A visit to The Tsukuba Museum Of Art is almost always a stimulating and worthwhile experience. Whether for a show of one of the surprisingly impressive local art circles (which could be of painting, sculpture, calligraphy, photography, crafts etc. ), student exhibitions (either university or high school) or to see the works of famous or not- so- famous professionals, a walk through the museum`s comfortable and conveniently do-able confines can sometimes provide aesthetic pleasure , and even more often, help us to gain deeper insights into Japanese culture. With the amateur groups, no matter what the level of skill (though it is sometimes amazingly high! ), I have often found the SUBJECT MATTER that is dealt with (or NOT dealt with) to be of great interest (imagine one hundred photos of Lake Kasumigaura and its environs WITHOUT ONE SHOT of birds caught in nets! ). As can be expected, when the works of certain professional artists, especially those with the ability to tune into the TIMES and capture the mood of a generation, are on display, our viewing experience becomes all the more enriching. The current show at the museum, that of the works of Aigasa Masayoshi (b. 1939 in Tokyo), is truly rivetting, due to both the artists skillfull use of paint on canvas, and for the insightful portrait that he paints of contemporary Japan ( or should I say modern life in general). For Aigasa (it seems to me), the old Japan of (idealized) deep and warm community relations, has been been all but lost , overwhelmed by modernisation and urbanization, which have left us dazed, numb, and most importantly- lonely. He shows this (I feel), by choosing to focus on certain symbolic subjects, with the ones which stand out most being- train stations, zoos, and parks. Not having ever seen any of Aigasa`s works before visiting this show( or having ever heard of him), I was at first puzzled by his selection of subject matter. 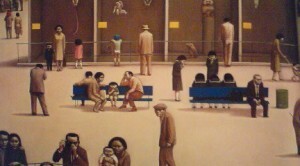 While I could easilly recognize the malaise, boredom and alienation imbued into the human characters he paints, I could not understand their connection to train stations and zoos. Then it hit me. In Japan trains are, and have long been, the chief symbol of this country`s frantic and successful program westernization and modernization which began in the Meiji Period(starting in 1868) . 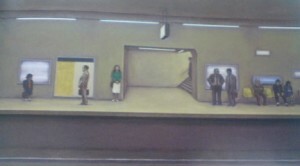 Realizing this as I gazed at these paintings gave context and depth to the array of station platform scenes that he has created. 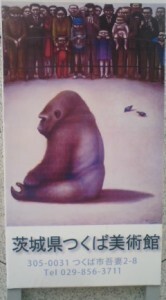 As for the paintings of crowds gazing at various zoo animals, a similar understanding struck me. Modern man, who has evolved over millions of years IN A MORE NATURAL SETTING now often lives in small apartments in gray cities, and works in flourescently- lit- white- walled- offices – like a fish out of water, or a spiritually deadened animal which has been taken out of its natural habitat and put on display in a concerete cage at a zoo. Aigasa further captures this feeling with several depictions of people at public parks, which he shows as open spaces with a few sad, stick-like trees, filled with sad, lonely(even if with a lover) humans. I sometimes suspected that the mood and tone of Aigasa`s works went beyond being his tuning into the world around him and were in fact a reflection of his own, dark, perhaps depressive personality. 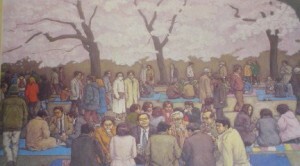 The painting that really had me thinking this was the large HANAMI (cherry blossom party) scene which captures none of the atavistic energies and excitement which are usually released at these events. The artist has created a scene of people who seem to be just as dulled as those waiting for trains in his stations, or crossing the street at his intersections. This exhibition should also be of interest to those interested merely in skillfull and often beautiful painting. For me, his shadows and empty spaces are where he creates the most striking textures. 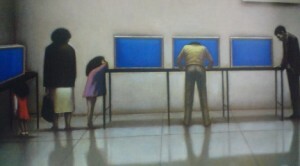 His Miru Hito ( People Looking), of 1972, will amaze anyone with its 3 dimensionality. As you ebter the exhibit, and look straight down the corridor you will see it. I was sure that it was a shadow box, made with layered cut-outs, until I was right up at it. This work is also thematically interesting and represents another of Aigasa`s typical motifs- people as observers, watchers and onlookers. How true in this when people spend much more time looking at the tv screen or computer moniter than anything else. The exhibition, called Daily Life- AIGASA Masayoshi will be at the Tsukuba Museum of Art (at Ars Hall, just North-East of the TX Terminal) until May 24th. Admission is 380 Yen for adults. Even if you miss this excellent show, be sure to check out whats going on at the museum. There is USUALLY something worth seeing- very often for free! By the way the artist`s name is written 相笠昌義　in Japanese characters.